We are now just two weeks away from the premiere of a brand new season of Star Wars Rebels, which will feature appearances by many fan favorite characters including Grand Admiral Thrawn, Darth Maul, and Wedge Antilles. It seems we have another name to add to that list. Katee Sackhoff, best known for her role as Starbuck on Battlestar Galactica, appeared at the Oz Comic Con in Sydney, Autralia and confirmed that she would be reprising her role of Bo-Katan from Star Wars: The Clone Wars on Star Wars Rebels. Sackhoff told fans that she had already recorded her lines for an upcoming episode of the series. Bo-Katan was Pre Vizsla's must trusted lieutenant in Death Watch on The Clone Wars. Following Vizsla's death at the hands of Darth Maul, Bo-Katan rejected Maul's leadership and lead the resistance against him. 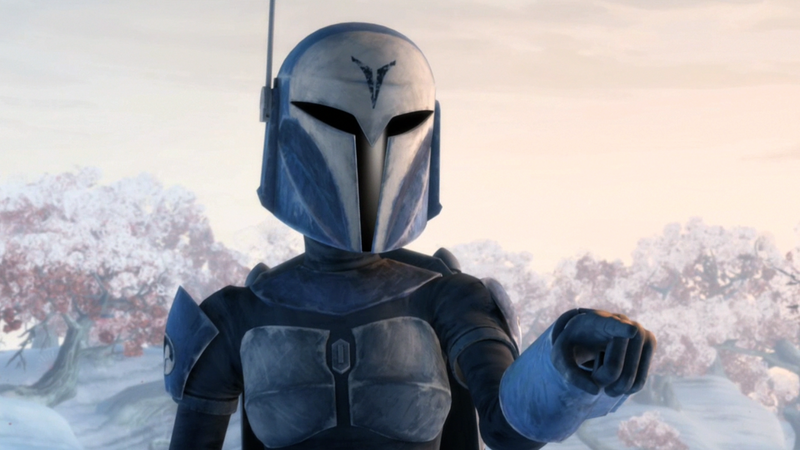 Season Three of Rebels will feature a large Mandolorian presence and it's exciting to learn that this will include Bo-Katan. Due to the premature cancellation of The Clone Wars series, what happened on Mandalore following the Clone Wars remains a mystery. We saw last season that the Empire had bought the support of the Mandolorian group on Concord Dawn led by Fen Rau. We see in the Season Three trailer that there are more Mandos who are loyal to the Empire. The question is, where will we meet Bo-Katan? Given her claim that no outsider could rule Mandalore, it seems unlikely she'll be working with the Empire. We also know that Sabine comes from Clan Vizsla, which made her a traitor in the eyes of the Mandos loyal to the Empire. Given Bo-Katan's loyalty to Pre Vizsla, that connection is intriguing. Bo-Katan certainly could make a powerful ally for the Rebels. Star Wars Rebels Season Three Premieres on September 24th at 8:30pm with the two part episode "Steps Into Shadow" (check out my spoiler free advance review of that here) on Disney XD.